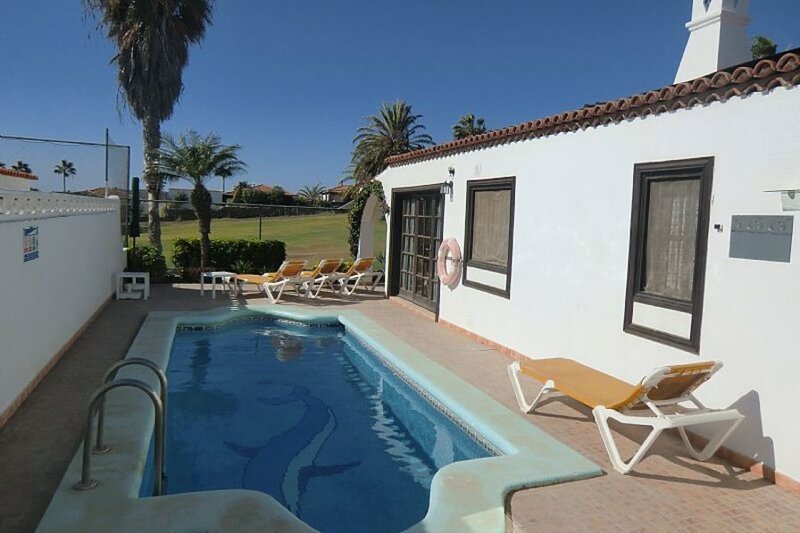 This lovely detached Villa in Amarilla Golf and Country has a private pool, wifi and enjoys a pretty location just 200 metres from the sea and overlooking the golf course too. This well positioned detached villa is set in an quiet cul-de-sac, lined with villas running down to the sea. To the front, side and rear of the villa are garden areas with tropical trees, shrubs and flowers along with a rear terrace with views over the golf course to the sea. The villa, which comfortably accommodates six people, is comprised of 3 spacious bedrooms. The master bedroom has a large en-suite with a walk in shower. There are 2 twin bedrooms all with ample wardrobe space. There is a separate family bathroom with a bath and walk in shower. The spacious open plan lounge/dining room has spectacular views over the golf course to the sea. The kitchen which leads from the lounge/dining room is equipped to a very high standard provides everything you need. The covered terrace which boasts a BBQ is ideal for al fresco dining. Satellite TV is provided with 100s of UK channels. (Including BBC, ITV, Sky etc). The local area offers a variety of bars and restaurants plus a well stocked supermarket. The marina is a short stroll away along the coastal path, and offers boat hire and water sports and also trips in the yellow submarine. The marina has a lovely sea front promenade full of restaurants and bars. The marina separates the resort of Amarilla with the neighbouring one of Golf Del Sur. Further into the resort of Golf Del Sur is the San Blas Commercial Centre that consists of 3 picturesque squares each containing good quality bars, restaurants (many with evening entertainment), shops and boutiques. The nearby Spanish village of Los Abrigos is just a 10 minute taxi ride and here is a small fishing port, full of some of the best fresh fish restaurants on the island. All attractions such as Siam Park and Jungle park are only around a 15 minute drive. Los Cristianos is a mere 15 minute drive away where you will find golden sandy beaches and plenty of shops, bars, restaurants and nightlife before you return back to the relative peacefulnes of La Quinta Villa and the resort of Amarilla Golf. Solar heated private Swimming Pool, Sunbeds, Rear Terrace with Table, Chairs and Parasol with views over the Fairways to the sea and gardens with Tropical Trees, Shrubs and Flowers, Clothes Dryer. 15 minutes from Airport, 10 minutes to Los Cristianos and 15 minutes to Playa de Las Americas (by car). You will be given the number of the local management company who can assist you if you need them.